Keith ,how come you go all over the world ? What do you do for a living ? My guess is that your are a reporter maybe . I don't think that you really are that dog in that picture . You might never answer my questions . But, today the American people are getting so squeezed by the acts of the Feds and the government that a rebellion could be in the making .Everyday it seems more apparent that the acts of the government are not acts of represntation of the people or for the people .You would think that the real taxpayers would have some choice in what happens in America . Why is middle America getting squeezed so bad . The rich and poor get the hand outs and middle and upper middle classes pay the bill? Now back to those pastor tapes! can't say i condone such behavior, but i understand it and bet many more do too! "against the evil freedom-hating Soviet communists,"
Nonesense Keith. The Soviets were peace loving people who provided "FREE" health care to their people. In Cuba and N. Korea everyone has access to "FREE" health care and uemployment is 0. How dare you speak ill of the communists? Anon brings up a great point. Here you are talking about how we're in a depression and the world is coming to an end. And yet somehow you have the time and money to travel all over the world. I guess the depression is happening for everyone else except you....and the legions of HPers who make $250K a year and have a gazillion dollars in the bank. The Budapest Symphony made a US tour in 1993(?) with Leonard Penario tagging along. They performed Rachmaninoff's 'Rhapsody on a Theme of Paganini.' and it was magic. I would highly recommend a night on the town with this fine symphony. Love that town, Keith. Enjoy. Spend some of your CFC/IMB/FNM put gains at Gundel (near the museum). Hungarian wines -- amazingly good too. Have the Hungarians renovated their cathedral yet? -- it was still pretty shabby when I was there last. Youll see how developed budapest is. Its quite charming actually. You should do something that a friend of mine and me are doing. We bring back a real estate listing from every capital city we visit and compare with our own prices. We´ve found out how ripped off we get;). It takes about 14 months for the Canucks to review an aid application from one of these people and during that time the refugees get food, shelter, and basic medical care courtesy of Canadian taxpayers. As an American, I don't know whether to laugh or cry at this story. Canadians are so sanctimonious about how badly we supposedly treat illegals from south of our border. Now that fat Americans are filling up their shelters. hospital emergency rooms, and clogging their courts, I wonder if they will be as generous as they demand us to be? Thinking about going to Budapest myself for a week or two. First off, how's the night life there? Secondly, is it true that you would rank the women there as among the hottest in the world? Your thoughts would be appreciated. Thx. You shouldn't worry about paved roads and running water, Keith. What you should be worried about is your own ignorance. Budapest is an interesting city. I visited in 1991, just when the eastern Europe was opening. There were impoverished neighborhoods, and my wife and I stayed in a room in a three bedroom apartment with the tenants, who lived in the other rooms. Great goulash. The Western franchises were taking root already, though. There was a Hilton along the Danube, and a three-storey Burger King. See the big Synagogue, quite a sight. Actually, Franco offered to send air support, but needed his planes refueled in West Germany. Eisenhower ordered the Germans not to let them do it. 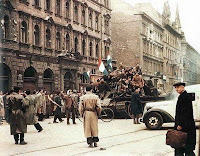 Eisenhower hated the Hungarians just like George Bush hates us. must be young, how else do you prepay quarterly health insurance bill...as the company i use will not take prepayments, as neither does the IRS take prepayments of prepayments of estimated tax??????? ?.......or i have yet to figure corectly???? The United States has outsourced the manufacturing of its electronic passports to overseas companies — including one in Thailand that was victimized by Chinese espionage — raising concerns that cost savings are being put ahead of national security, an investigation by The Washington Times has found.